Honesty is our Best Policy! At Salerno Duane INFINITI, we know your time is valuable and we don’t waste it going back and forth. We give you our best price up front, and all you have to do is come in to test drive, sign for and drive away your new vehicle. No gimmicks. No parade of sales managers. Just honest, great pricing for the INFINITI of your dreams. The Salerno Duane REALPrice. In today’s fast-paced world people don’t often have time to spare. They certainly don’t want to spend their precious time going back and forth in a dealership with a team of salespeople over a few dollars a month. We’ve recognized this and built an expedited sales process that skips all the unnecessary steps and gets you into your new vehicle as quickly as possible. We’ve become a society of instant gratification. Traditional sayings tell us “Good things come to those who wait”. Here at Salerno Duane, we are realistic. You can’t buy a car with a quick swipe of your debit card or a fast stop at a drive-thru window… but why does it have to take 3-4 hours? It doesn’t. We will make it as convenient for you as possible by working with you from the comfort of your computer or wifi connection. We’ll get everything ready so all you have to do is come in to the showroom to test drive and sign for your vehicle. Buying a car shouldn’t feel complicated and burdensome. We will be working on the process before you even show up and then present you with everything ready to go after your test drive. Car buying in it’s simplest form. 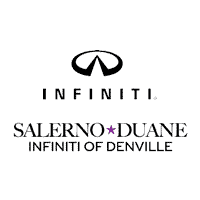 The Salerno Duane INFINITI of Denville REALPrice empowers salespeople to find the INFINITI of your dreams and handle the transaction themselves. We will give you our best price up front, all you have to do is ask! No need for whispering and lots of back and forth. Start shopping online and when you’re ready, we’ll make this easy!